As I was driving through the pasture looking for a big axis buck I had heard my phone receive several emails. Like so many of us these days I’m pretty much attached to my smartphone and as I drove to the top of the biggest hill on the ranch I decided to pull over, glass the valley below me, and check my emails. I opened my email and noticed I had an email asking about if I could do bison hunts and turkey on the same hunt. Spring Turkey season in Texas runs from about mid-March through the end of April and I knew that was really pushing it, weather wise, to try and kill a bison and I knew the reply needed to address those issues was going to be too lengthy to deal with in the middle of a hunt so I went back to glassing the valley below. When I got back to the house that evening I replied to the email and explained my concerns for killing a bison in March or April. I sent the email and headed to bed thinking I had just talked myself out of a hunt. Needless to say I was very surprised to get a call in March from Arden and Rhonda, two coonass’ from Louisiana (their description, not mine) to start discussing details about pulling off a bison and turkey hunt on the same trip. After numerous phone calls to get all the logistics in place to make the hunt happen, and all the details worked out, we picked out dates and made plans to meet at the ranch out in West TX. A few weeks later I was packing up and heading west. I was really hoping for some cool weather, but it looked like it was going to be fairly typical weather for early April. Lows in the high 40’s or low 50’s with highs in the low 80’s. I knew I was going to need some help getting it skinned and cooling off so I had arranged for Ruben Ramos, maker of Ramos Knives, to come help. He’s helped me with several aoudad and bison hunts in the past and I knew with his help and his knives we weren’t going to have any trouble getting it skinned and cooling off. I arrived at the ranch a couple of days before Arden and Rhonda and went about scouting for a big bison bull. As I mentioned in a previous blog, finding these big bulls is the hardest part. Once you get them located the actual hunt for them isn’t all that difficult. I’m always amazed at how well a 2,000+ pound animal can hide in such sparse vegetation. 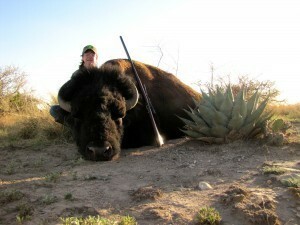 After a day or so of scouting I had a real big bison bull located and was ready for Ruben, Arden and Rhonda to show up. 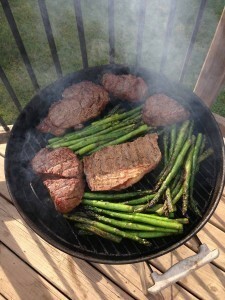 I had dinner waiting on them when they showed up…. We had planned on going after the bison early the next morning, but since everyone got to the ranch a little early, we had a big bison bull located and we were done with dinner we decided to go out that afternoon and see if we could get him on the ground tonight. Plus if we were lucky enough to get him on the ground tonight Ruben and I could get him skinned, put the head and cape in the freezer and let the meat hang over night so it could chill before we put it in the freezer. If we put the head, cape, and meat in the freezer while it was still warm there would be no way the freezer could get everything cold and we would probably loose the cape and quite possibly the meat. As we headed out into the pasture the wind was blowing like crazy, which is fairly common in west TX in the spring. Winds were sustained over 20mph with gusts approaching 30mph. That helped cover our noise, but Rhonda would be shooting her 1885 Uberti replica chambered in 45-70 and shooting a 325gr bullet in this wind would be a challenge. We were going to have to get inside of 150 yards, which is pretty close on an animal of this size. The bull had moved quite a ways from where we had spotted him earlier in the afternoon, but luckily he was a little more out in the open and not held up in the thick cover like where he was earlier. We circled around to get closer and just as we got into position the bull started thrashing cactus and tearing up bushes just to remind us who was the boss!! We got out of the ranger and began our stalk. There was one bush between us and the big bison bull and as long as we kept that between us and the bull I thought we could get to about 120 yards. The wind once again helped us get close but when Rhonda eased around the bush and set up on shooting sticks it made it pretty difficult to steady her rifle. When she would get steady the big bison wouldn’t be in the correct position and when he would be in the correct position Rhonda wasn’t steady. Since we eased around the bush the bull could easily see us and since we were so close I knew there was nowhere to run if the big bison bull decided to charge. Luckily he wasn’t very interested in us and after a few tense moments he turned broadside and Rhonda had enough time to get steady for the shot. She made a perfect shot and the bison ran about 30 yards but didn’t go down. Rhonda quickly reloaded and when the bull turned and presented a quartering away shot she put another round in him. This shot once again hit it’s mark and the big bison trotted about 60 yards and began to wobble. As I turned and looked at Rhonda I realized the bull wasn’t the only one wobbling. Rhonda had held he composure very well…..until after the second shot. That’s when “bison fever” took over and she had to take a knee, catch her breath and gather her composure. Rhonda quickly gathered herself and as we walked up to where the bison had been standing we saw a good blood trail confirming that both of the first two shots had hit their mark. The bull had laid down, but we didn’t want to take any chances, plus we wanted to finish him off to keep him from suffering, so we eased in for one final shot. We got to about 50 yards and Rhonda put one final round in him, he jumped up and ran about 15 yards and was down for good. As we walked up to the huge bison bull laying there we were all amazed at his size. I’ve seen quite a few bison over the years, but I’m always amazed at their size and this big bull was no exception. It took a little while to convince Rhonda that the big bull was dead, but once I did she finally got her hands on him. This hunt had been in the works for Arden and Rhonda for a long time. These two coonass’, as they proudly referred to themselves, had done their homework, had been researching hunts for 9+ months, and had traveled a long way from Louisiana out to West Texas. 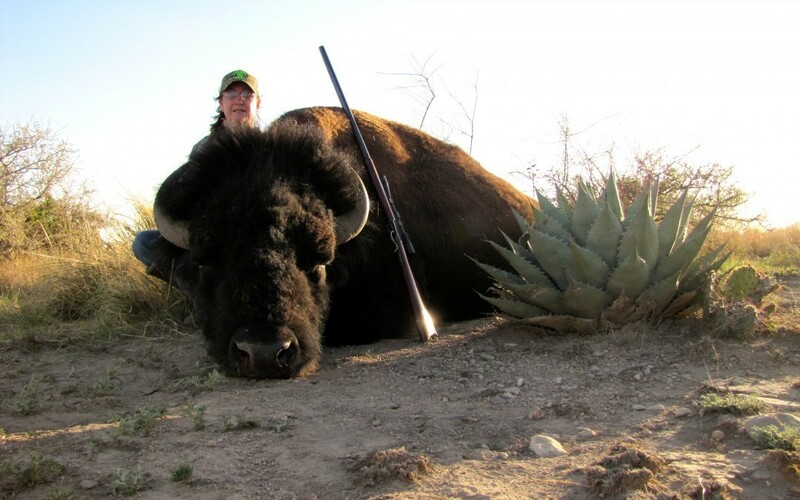 It had been Rhonda’s lifelong dream to go out West and kill a bison with her 1885 replica and she had just done it! After pictures and congratulations it was time to get to work. Daylight was fading and Ruben and I had our work cut out for us. We needed to get the big bison bull skinned and cooling so we didn’t loose the cape and the meat. As Ruben and I got to work on the bison, Arden and Rhonda held lights for us and kept us entertained with stories from the Louisiana swamps. It didn’t take us long to get the bison skinned and the head and cape in the freezer to start cooling. We left the carcass hanging overnight to cool and early the next morning we quartered the bison and got the meat in the freezer. We had a pretty good drive back to Central Texas to drop off the head for the mount, the meat to the processor, and a Rio Grande Turkey for Arden so we loaded up and hit the road. Thanks for joining me on another hunt and thanks for reading. But if reading is no longer enough for you, you can book your own bison hunts right here!